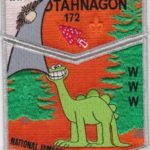 Ray Gould brings word of a new discovery from Otahnagon Lodge #172 in the Binghamton, NY Area. 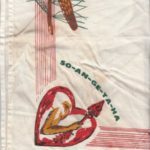 The Blue Book lists six known chapters for Lodge #172, two of which, Konoh and Ches Ches Nopa, were known to have issued neckerchiefs. 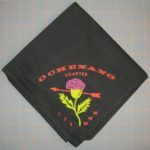 It now appears a third chapter Ochenang also issued a neckerchief as a means of chapter identification. 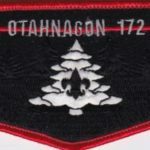 While he has not been able to confirm this issue with anyone from the lodge yet; the design contains all of the elements you would expect from a Otahnagon Chapter issue. The Lodge number (but not the name), WWW, Red Arrow and the chapter name (and the spelling matches the ‘known’ chapter name). In the Oneida dialect written Ochenang, and meaning ball thistles. The place was afterward called Chenango Point, and is now Binghamton. The Ball Thistle appears to be the plant design on the neckerchief. Everyone has a right to a university degree in America, even if it’s in Hamburger Technology. 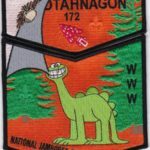 That is the Othanagon 172 , Ochenang Chapter totem on the neckechief. Ochenang was for OA mmbers in the area near Norwich NY. I remember the Blue Thistle as Cleon Bellamy one of the adult leaders for 172( one of the greatest influences in my life too) was in that Chapter and wore that neckechief. That influence got Tsungani to make their own ( I was in Tsungani). THAT’S MY CHAPTER!! 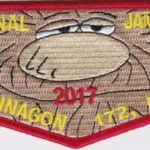 I was chief 2010-2011, and tonight a new chief will be elected- is there a way to bring these back (i.e. who made them, what is their contact info)? This is a 50+ year old neckerchief from circa 1655-1960. If the current chapter executive board wishes to make a new version, they need to work with the LEC for approval. Not sure the process in you lodge. I’d be interested in getting one of the new ones too.